interactive audio-visual installation by Atelier Avant - Se-Lien Chuang & Andreas Weixler. The room reacts to the audience in algorithmic choice of pictures and their transformation and processes realtime audio within an electroacoustic composition. Se-Lien Chuang concept, audio & visuals & Andreas Weixler audio & interactive programming. The system is very flexible in size and to the exhition place. Coordination Atelier Avant, Graz, Austria, studio for music & art computing of Weixler-Chuang. 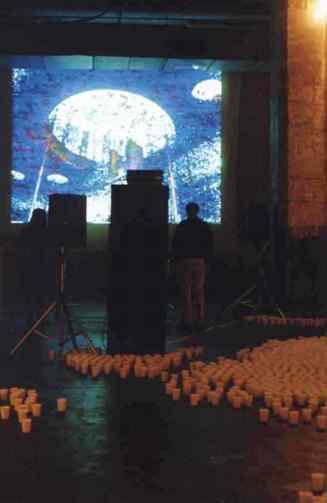 "Living cave" developed at Nagoya City University, School of Design and Architecture, Japan 2000-2001 during a research in computer music and interactive audio visual computer arts. "cave" by Se-Lien Chuang at Sheffield University Sound Studio (SUSS) in England 1999 during a composers in residence of the artists.